Tired of keeping up with endless format wars? Bored by the demise of cassettes and floppy disks? Conscious of the dematerialization of the musical work and its restless digital hybridity. In 2007 Electric Crinolines offered their first single in the nearly indestructible format of a MIDI file. This file combines the functionality of a traditional pianola scroll, with all the modalities of digital code. Appropriately enough, their first single is entitled (I want to be your) databody, and they surely do want to make a date with your preconceived ideas of musical data and get physical with thrash synthesis modulations. 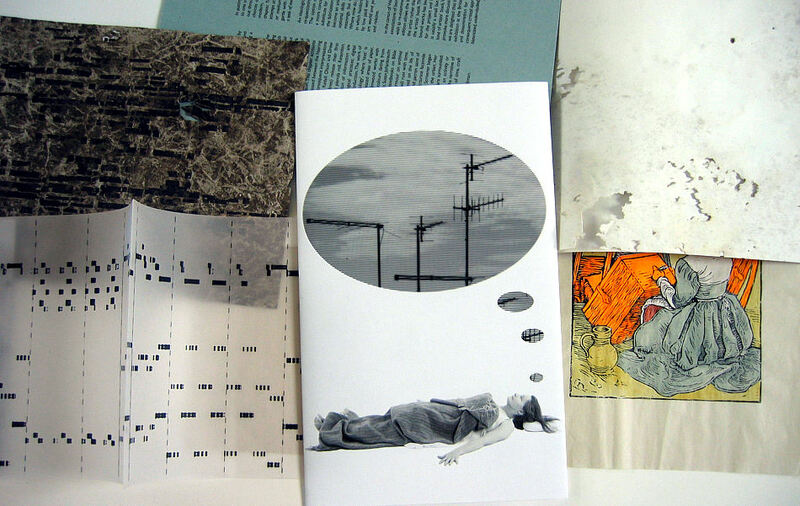 ‘I Wanna Be Your Data Body’ by The Electric Crinolines (bottom left) and other pages from ‘Cunning Chapters’, edited by Susan Johanknecht and Katharine Meynell (2007). Everyone uses them, but the materiality of MIDI files isn’t often recognised as the language of modern pop music, driving drum programmes and synthesizers, as well as providing the synchronisation language for domestic Hi-Fi systems. MIDI – the musical instrument digital interface protocol – is the most universal language available for communication across all currently playable electronic, computer and real time analogue equipment. MIDI provides the digital data which drives the key parameters of musical information on all other formats. In some respects, MIDI harks back to medieval musical notation, providing a rawer form of musical material than modern, heavily annotated sheet music scores. But the naked data of MIDI is also its conceptual strength and accessibility. Rarely seen by listeners and pop receivers, the visual representation of MIDI files is now as familiar to music production artists as sheet music. By a peculiar historical paradox, although MIDI files can take different forms, the most familiar embodiments are nearly identical to the mechanical piano music format which became known as Pianola. Keen to bring listeners closer to the conceptual materiality of their music, Electric Crinolines first proposed releasing their single as a pianola scroll. When they discovered that modern pianola scroll production simply translates a MIDI file into a mechanical hole puncher, their path was clear. Rather than restricting their potential audience to pianola enthusiasts, they offer their music in a format which can still be translated into pianola scroll, but retains the adaptability of MIDI files for musical synthesis. Hey presto, the SyntholaFormatTm was born. Cunning Chapters is a collaborative artists’ book curated by Susan Johanknecht and Katharine Meynell. Thirteen chapters are thematically linked by concerns of ‘well madeness’, loss and conservation in the production of artwork, using a combination of technologies.Stephen Bury has written a manifesto for the artists’ book as an introduction. William Cobbing works in ‘posthumous collaboration’ with Bob Cobbing using faulty photocopying techniques, burial and excavation. Georgios Boudalis writes about repair of book bindings in his archaeological work on St. Catherine’s Library in the Sinai. Clippety Clop’s deaf lead singer Aaron Williamson accounts for acoustic information passed between the hearing and the non-hearing. Electric Crinolines release their first single as (non functioning) pianola roll. The work of Finlay Taylor uses ‘text’ which is eaten away by snails in treated areas of paper. Sigrid Holmwood works with pigments, combining unearthly colours dating from Tudor recipes to modern Day-Glo. Susan Johanknecht reworks diagrams from science textbooks and lists descriptions of armour using staples that will rust. Katharine Meynell’s chapter is based the life of Santa Chiara, performance artist and patron saint of television. Kate Scrivener began with the desire for the wild within the urban, two painted London twigs are surrounded by a haze of digital dots. Louisa Minkin handset the narrative of a clockmaker to explore experiences of time, craft and craftlessness.In putting these chapters together their relationship to each other produces a range of concerns played out through the ‘thingness’ of the book. The whole has been Coptic bound by Kelly Wellman in an edition of 60 copies.